I seem to be having a string of bad luck. For the last three weeks my family has been fighting hand, foot, and mouth disease. My youngest had it first, then my husband, and today I had to pick up my oldest who seems to have come down with the high fever and sore throat that begins the illness. During these three weeks my father managed to fall and break his hip requiring surgery 2500 miles away. That's a whole other story for another day. To add to it all my oldest was formally diagnosed with ADHD this summer (after three months of appointments) so we have been adjusting our lives to deal with the diagnoses. I'm feeling a little burnout out and as most of you have probably noticed my blog has taken a back seat. I though that once my kids were both in school that I would have more time during the day, that has failed to come to fruition so far. I'm hoping that things will calm down soon and I will be able to go back to blogging more regularly. When I'm stressed out I bake. I find baking to be almost therapeutic, it helps me to calm down and feel more like myself when life gets crazy. 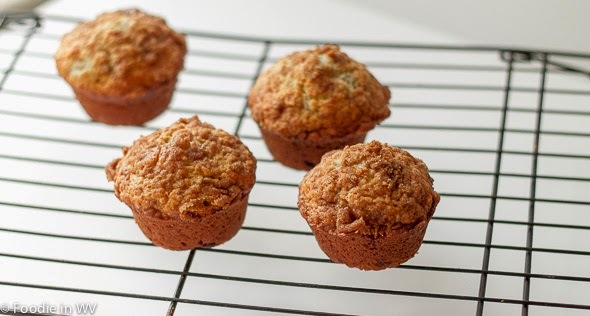 My kids love banana flavored anything so this week I made a new recipe for Banana Crumb Muffins. The recipe is as follows. Adapted from Taste of Home. 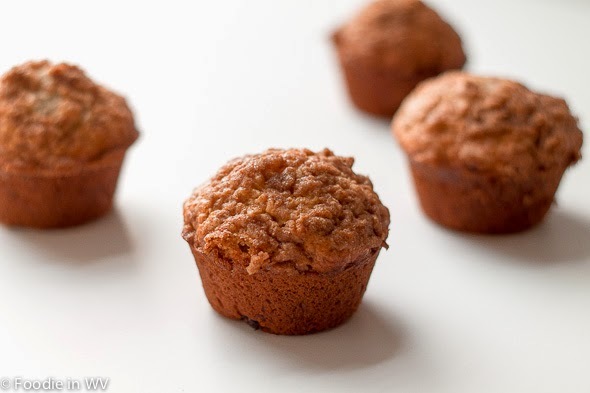 An easy banana muffin recipe with a delicious butter crumb topping. 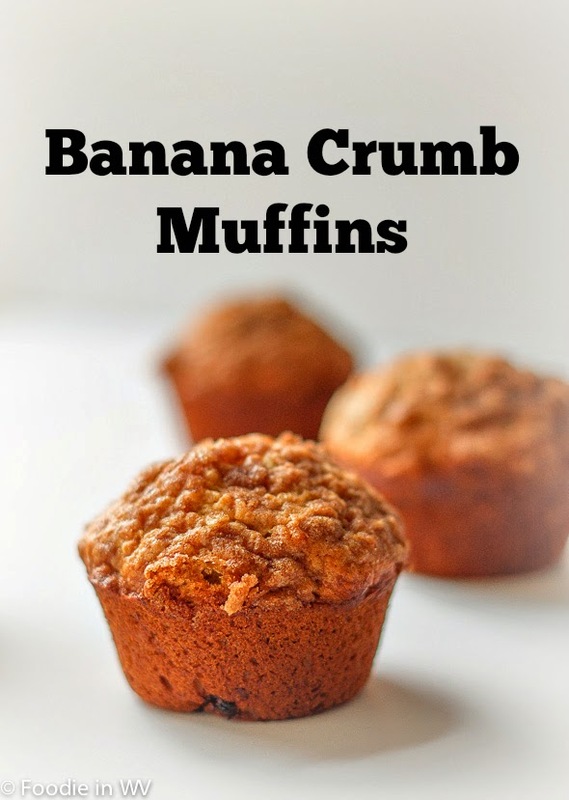 Great way to use over ripened bananas. Combine dry ingredients together in a bowl. Mash bananas either with a fork or a blender/food processor (I prefer this method). Add bananas to sugar, egg, and butter and mix well. Stir wet ingredients into dry and mix until just combined (do not over mix). Fill muffin cups 3/4 of the way full. Combine the sugar, cinnamon and flour for the topping. Add butter and mix until crumbly. Sprinkle topping mixture over the tops of the muffin batter. Bake in a preheated 375 degree oven for 18-20 minutes. Let cool in pan 10 minutes. I have not tried making this muffins gluten free so I can't attest to whether they would turn out or not. The butter may be substituted for canola or vegetable oil. You could also experiment with using Greek yogurt instead of part of the butter to reduce the fat and increase the protein. I do this frequently with muffin recipes and it works well. Oh jeez - you guys have been having some bad luck lately. Hopefully things turn around soon! Thanks :) They are so easy too! Hope everyone gets better real soon. Thanks :) I appreciate the kind words! I'm sorry to hear things have been not so great lately. Here's to hoping for everyone being back to 100% soon. Thanks, I'm hoping it will be calmer this week!